Remote Sensing of the Terrestrial Water Cycle is an outcome of the AGU Chapman Conference held in February 2012. 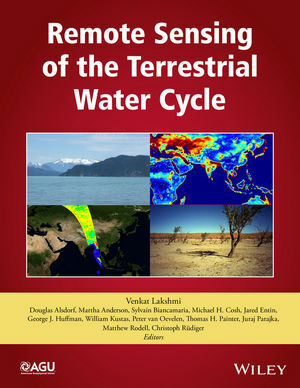 This is a comprehensive volume that examines the use of available remote sensing satellite data as well as data from future missions that can be used to expand our knowledge in quantifying the spatial and temporal variations in the terrestrial water cycle. Remote Sensing of the Terrestrial Water Cycle is a valuable resource for students and research professionals in the hydrology, ecology, atmospheric sciences, geography, and geological sciences communities. Venkat Lakshmi is a Professor at the Department of Earth & Ocean Sciences in the University of South Carolina. He currently chairs the AGU, Chapman conference Program. His research focuses on the eco-hydrological processes and satellite remote sensing. He has published extensively in various geoscience journals including the AGU journals Journal of Geophysical Research and Water Resources Research.